We have been using email since the internet first become popular. So we have ended up on a lot of spam lists. By necessity, we developed techniques to help us keep our original email addresses. We help organizations get control of their email. Each client works with a different combination of software and topics. We help you identify the key words applicable to your business, and develop a customized AntiSpam solution for your needs. We help you carefully define the rules so you do not weed out the good emails you want. We can help you locate the sources of your spam and block their IP addresses. We advocate making your own rules, and taking charge of your own email. There are email services that will supposedly clean your inbox of spam. But they apply rules that are too general for your specific needs. Too often they weed out emails you want to keep, and you won't find out until too late. No one knows the email you want to keep better than you. Anyone can avoid all spam 100% - by deleting all the email in their in box. But of course, you want to be sure you get the good emails. We recommend that you get this program which stops the spam automatically, based on the from addresses. It can weed out 80% of the spam. Microsoft Outlook rules (in more ways than one) and will take care of the other 20% of the spam. It is the most widely used email program and has an excellent rules feature, that is fast and easy to use. 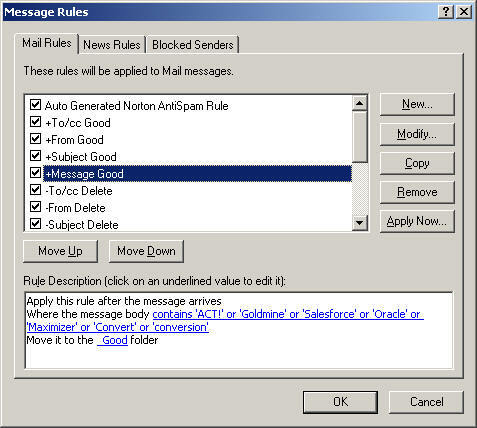 You can apply the rules to the Inbox at any time to help refine them. You don't want to have to make too many clicks to set up a rule. This is important, because you will need to adjust to spam, as the spammers use new trick. The major idea here is a shift of thinking of the InBox as the primary place to find your good email. In many cases, the InBox is hopelessly full of spam. So we will create a "_Good" folder, to pick out the good ones from the InBox. Basically, we will automatically pick the good ones Out of the Inbox. We suggest you set up the following folders in Outlook. The names that are not bolded are not as relevant here. The purpose of the underscore _ before some folder names is to help alphabetize them in to the order which is most convenient, and easy to drag and drop in to. Mail in this folder is suspect, and ideally would be blank. After setting up the folders, you will find the _Good folder filling up with good mail. The InBox accumulates the usual spam. You can check over the InBox, and sort by From address to see if there are any good emails you would like to keep. Create an appropriate rule for these, then run the Rules Again. Continue to refine your rules. Analyzing the InBox helps you develop effective rules. For example when you see a good email, see what key words it has that identifies it as good. Then make a rule that meets that criterion. When you are satisfied that the remaining spam in your Inbox is unwanted, drag them all to the _Spam folder. Double check to make sure everything in the _Spam folder really is spam, before going on the the next step. Otherwise you may be opting out email from people you want email from. If you find good ones, drag them back to the InBox and develop a rule to keep them. The _Spam folder is used to update the Norton AntiSpam rules. Do not directly drag them to the Norton AntiSpam folder, because they must be processed. 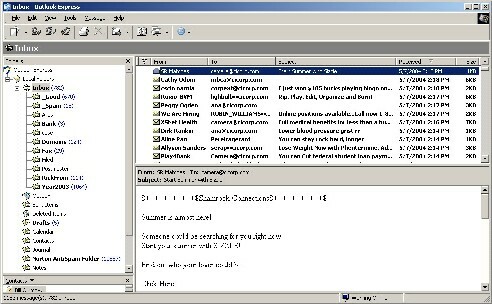 Norton AntiSpam will scan these emails and update the Blocked Address list. Then Norton will put them in the Norton AntiSpam folder. So let the program do this. 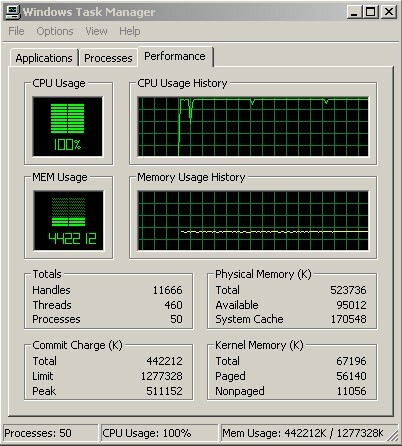 It may max out the memory while working. The process may take several minutes, and may need a lot of memory. So it would be a good time to take a break. However you may have to answer a prompt to confirm that Norton AntiVirus has detected and successfully removed a virus from an email. You may then empty the Norton AntiSpam folder. Get a Yahoo or Hotmail account for this. For example, we use CosmicInternet@Yahoo.com for any service we might want to try out for our web server. That way we can respond to emails to confirm activation of the demo. If the email address is sold, then Yahoo's and Hotmail's excellent antispam features will clear them out. If you have your own domainm you can sign up for a service such as Acme use a new name at your domain such as Acme@CICorp.com Then if you notice a lot of spam coming to this address, you know that Acme sold your email address to list vendors. With email rules you can direct anything to this address straight in to the Delete folder. But be careful of posting these emails on the web. If they end up on spammer lists, they are no longer useful, but an additional source of spam.